Terrific builder opportunity. Declarant rights can be transferred in the event that all 8 lots are purchased together. Minimum 1,600 Square Foot homes on lots ranging from 0.59 acres to 2.6 acres. Minimum setbacks are as follows: 30' FYSB, 10' SYSB, 20' RYSB. Tremendous opportunity to build on value priced lots in established subdivision with a great resale track record. Located in a beautifully established subdivision with over 90 homes ranging from the low $200s to mid $300s in pricing. 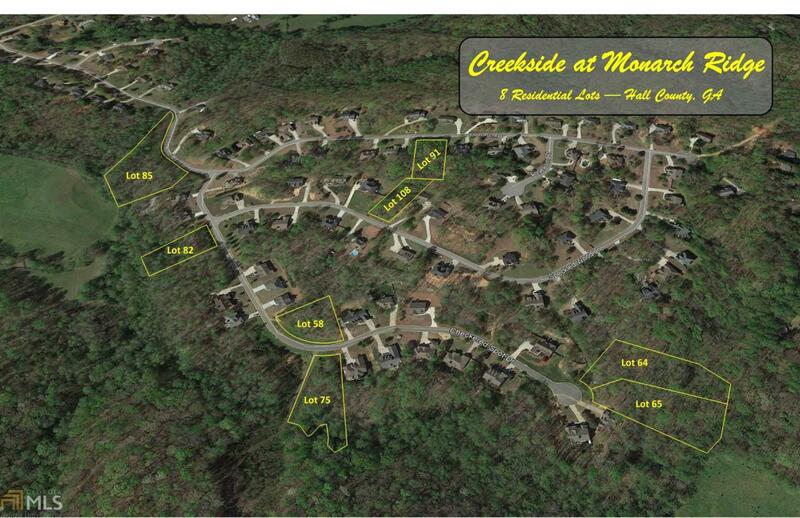 Creekside at Monarch Ridge is located on Elrod Road which provides a short 5 minute drive to Kroger shopping center, restaurants and services. Quick access to downtown Gainesville or Dawsonville Highway corridor via Sardis Road.